"This is a really easy and tasty Indian dish that is sure to stir up your taste buds. 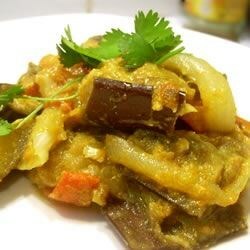 Delicious baingan bharta is ready to eat with pita bread, Indian naan, or rice." This is a recipe that made a great authentic (so it seemed to me) dish! I used 1/2 tbsp. minced ginger and 1/2 tbsp. minced garlic instead of garlic paste. Very yummy - probably not something most kids will like, as it's spicy and has that yogurt tang. Made it for a party and it was well received.